Manila Bay, located in Manila, the Philippines, had a bad odor with the piles of trash covering the sand of the seashore. On the day of the cleanup, waves came in due to the bad weather, which got the members wet, but they stepped in to clean up that area to improve the residential environment and raise the residents’ awareness on environment. 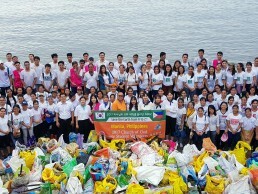 This day, the members collected a total number of 160 sacks of trash. Manila Bay, where the sand of the shore is now exposed, has changed into an eco-friendly space the residents can use pleasantly.